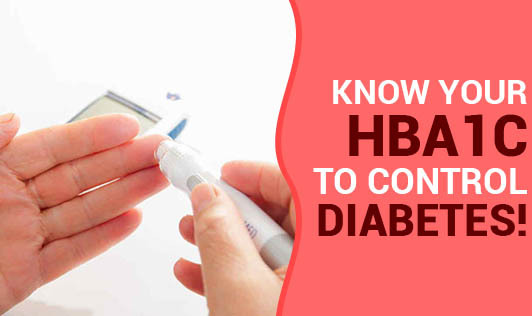 Know Your HbA1C to Control Diabetes! HbA1C is a lab test done for both type 1 and type 2 diabetes. HbA1C is the short form for ‘Glycosylated haemoglobin'. This test is recommended for diabetics at least 2 to 4 times a year. This test is more accurate than the blood sugar tests. After the body processes the food that we eat, glucose, which is the end product of digestion, combines with the protein "haemoglobin" in the blood. The amount of glucose which combines with haemoglobin is directly proportional to the total glucose present in the system. If the blood sugars have been high in the recent weeks, then the HbA1C levels are also high. How is HbA1C more accurate than the regular blood sugar tests? The average life span of red blood cells (RBC's) in the body is around 8-12 weeks, after which it is renewed. When the body processes sugar, glucose naturally attaches to haemoglobin in the blood stream. At 8-12 weeks before renewal of the RBCs, the haemoglobin will be saturated with glucose to form glycosylated haemoglobin. This can serve as a useful long tool to gauge blood sugar levels. Hence, HbA1C test is spaced after 90days of the previous test. While the blood sugar tests like FBS, PPBS and RBS gives you only the glucose levels in the blood that is highly influenced by your previous day's diet, hbA1C can give you a better result. It is wise to target a normal HbA1C range than your blood sugar level (FBS,RBS and PPBS). Maintain a healthy lifestyle and eating habit to stay fit and healthy.